In last Friday's blogpost, I discussed how to value U.S. Morgan dollars (1878-1921) and Peace dollars (1921-1935). In today's post, I'm going to write about a lesser-known American silver dollar—the Trade dollar. Unlike the Morgan and Peace dollars, Trade dollars were never intended to circulate within the U.S. They were produced exclusively for the purposes of international commerce, designed to compete with the silver dollar-size coins of other nations in the East Asian trade. In the late 19th century, China quickly emerged as an economic powerhouse in the Pacific. At the time, most international trading was backed by hard money, with large silver coins being the most frequently traded currency. But the Chinese were very particular about the silver coins they would accept. The normal U.S. dollar coins didn't meet the mark—they were approximately 0.5g lighter than the most widely-traded coins, the Mexican Peso and the Spanish Dollar, which means they contained less silver. U.S. merchants were forced to exchange their own coins for Pesos and Spanish Dollars before they could trade with the Chinese. As a result of lobbying by these merchants (as well as silver miners), the U.S. government authorized the creation of a new, heavier coin in 1873—the Trade dollar. Whereas normal U.S. silver dollars (such as the Morgan and Peace dollars) weigh only 26.73g and contain .7734 ounces of silver, the Trade dollar tips the scales at 27.22g and .7874 ounces of silver. With mintages in the hundreds of thousands to low millions (minus all the coins lost in the Chinese trade), the Trade dollar is considerably rarer than the Morgan and Peace dollars and subsequently commands a much higher price for all date and mintmark combinations. 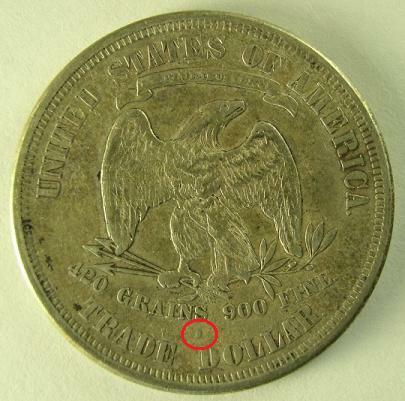 As you can see in the picture below, the Trade dollar's mintmark is located below the "S" in "GRAINS". The following mints produced Trade dollars: Philadelphia (no mintmark), San Francisco (S mintmark), and Carson City (CC mintmark). Of those three, coins with Carson City mintmarks tend to have the lowest mintages and are the most valuable. Collectors can expect to pay a minimum of $100 for a circulated Trade dollar. Below, I've listed the keys and semi-keydates of the series. If a coin is not included in the list, it's worth $100. All values are for coins in "Good" circulated condition. Coins in better condition will be worth more. The market is absolutely saturated with counterfeit trade dollars. I would estimate that as many as half of the unslabbed trade dollars listed on eBay at any given time are Chinese fakes, usually struck in base metals like lead or nickel. Unslabbed coins are coins that haven't been authenticated by a third-party grading service. Authenticated coins will come in a hard plastic slab that states the coin's grade and other details. 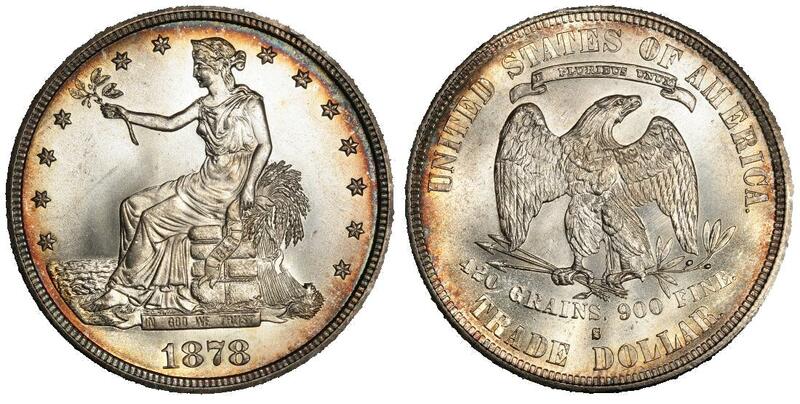 If a Trade dollar is in a PCGS, NGC, ICG, or ANACS slab, then it is authentic. Those are the only reputable third-party grading services. If it's just a raw coin, or slabbed by another grading service not listed, then buyer beware. If you have any questions about Trade dollars, or coins in general, please leave a comment. Interested in buying a silver dollar? Silver Dollar Co. has you covered. Max Breitenbach has been collecting US, foreign, and ancient coins for over a decade, and has been writing about them for nearly as long! Max is a regular guest blogger on CoinWeek.com. He is currently working on a collection of European silver crowns and is planning on finishing his US type set sometime within the next century. You can find him on Google+﻿. I picked up an 1873 silver dollar in Cambodia. It may be a fake, since it says “ONE DOL” on the back. Although the rest of the coin looks authentic. What do you think? @James: Does it have a slightly different design? If so, it’s most likely a reproduction of the 1872 pattern trade dollar. “Patterns” are coins struck to test out potential designs and were not intended for general circulation. As there are only 6 examples of the 1872 pattern in existence, yours is most likely a reproduction or counterfeit. I have a U.S. trade dollar dated 1872. What is the story on that? Is it a phony? I’d probably have to see a picture to give you an accurate value, but how big is the 3 and where on the coin is it located? I found on that has a little 3 printed on it. It’s a 1875. Is it worth anything?